Why is Fishing Line Diameter Important? Is it because the thicker the line diameter the stronger the line? Seems logical it would, right? But, is fishing line diameter the primary determinant of a line's breaking strength, that which bass anglers know as "pound test"? This may have been true in the past but not so much any more. The science of material composition and tensile strength of monofilament line, for example, has progressed over the years. Today bass anglers have a wide choice of small diameter lines made from incredibly strong materials with strengths equal to the thicker lines of the past. 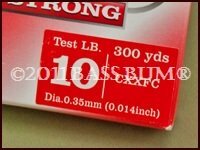 So when you pick up a box of line and look at its label you'll find the line size indicated in millimeters or inches, or both, next to the line's pound test number. Is this then, an indication of the lines "strength? Well, yes, but realize that "pound test" is not based on the thickness or the weight of the line. It's the linear or tensile material strength of the line. 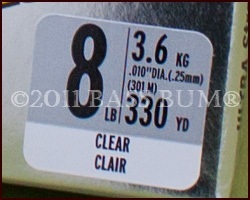 You will also notice that the diameter of the 10lb test line from one company is not the same as another. Since we all want the thinnest line with the highest strength he or she can get, what you should immediately appreciate from this simple observation is that between diameter and pound test rating,the more important of the two is its diameter. The drawing below is a rendering of three fishing lines drawn to scale (certainly not actual size) so each is shown as it compares to the others in diameter. Though each is 10lb test they have different diameters of .18mm, .28mm and .31mm. It's difficult to visually distinguish the difference in diameter of lines of the same pound test. Unless you're under thirty, or a bass. Hell, for an old man like me it's all I can do to see the line period, much less how thick it is. Everybody that can relate raise your hand. So for those of us who are visually challenged, the illustration below of three 10lb test lines shows that only a few tenths, even hundredths of a millimeter, is a significant difference when you're talking about something less than a millimeter in thickness. If Line Diameter Isn't Necessarily Critical to Strength, How Will A Small Fishing Line Diameter Help Us? There are many benefits to using the thinnest line with the highest strength other than just landing your bass. Less visibility to bass can mean more hook ups when using slow moving soft plastic lures. Better Lure Action Crankbaits dive deeperJerkbaits retain manufacturer intended action Live bait will be able to behave naturally on thin line and small hooks. Bass notice, don't think they don't. Enables the angler to better detect bass picking up plastic lures and finesse jigs. Transmits stronger signals to anglers of bottom structure and types of cover. Enhances Casting Less wind resistance makes for longer casts. Better on spinning reels.